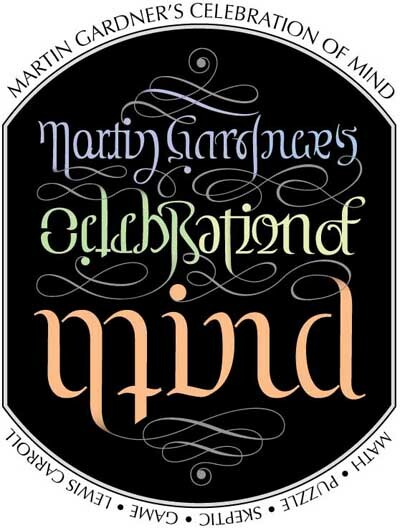 Over the decades, traditional and computer artists have joined mathematicians and skeptics in honoring Martin with cartoons, charicatures, and assorted clever visual representations. 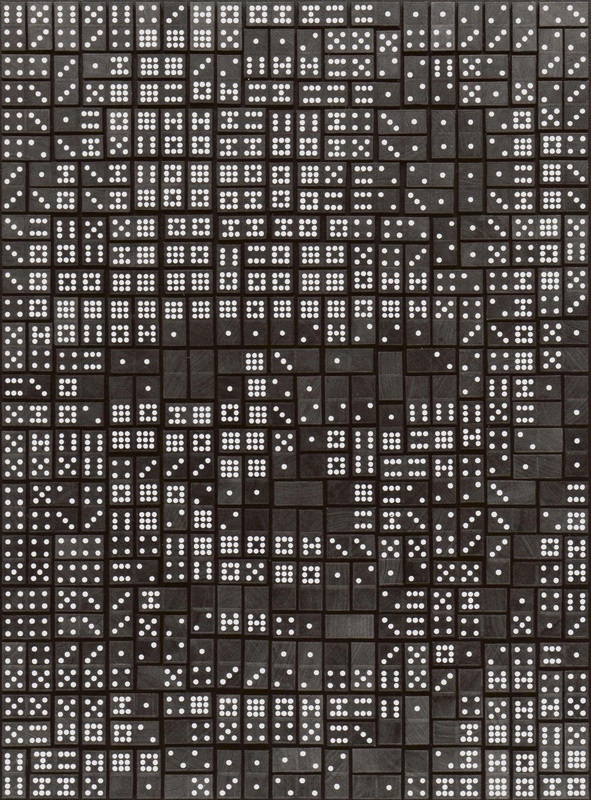 Some of these images were derived using mathematical principles, and others---such as the ever-popular Celebration of Mind series we start with below---employ ingenious ideas forged where the right and left sides of the brain meet. All images depicted are used with permission. 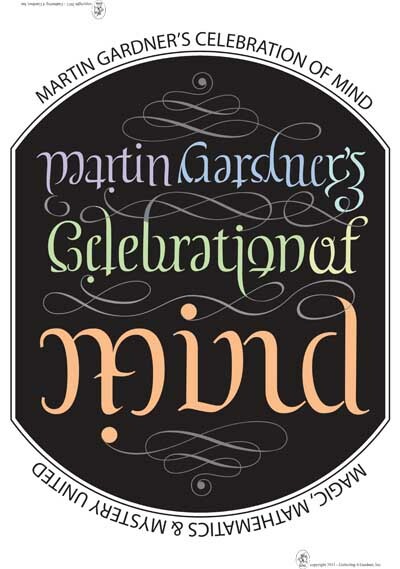 These wonderful creations use Martin's name, and were designed for use on 12 x 18 inch posters (and 4x6 inch cards) for the G4G spin-off Celebration of Mind events. 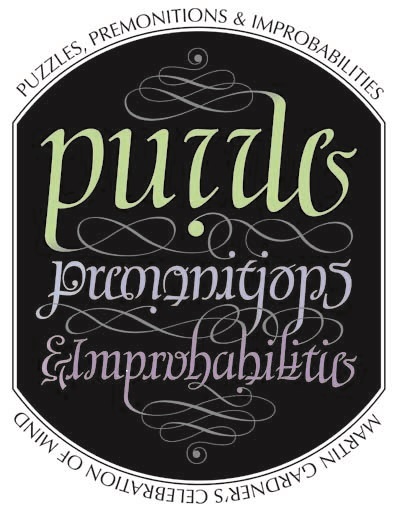 The above ambigram (or inversion) was designed by puzzler and artist Scott Kim for the first Celebration of Mind events in Oct 2010. 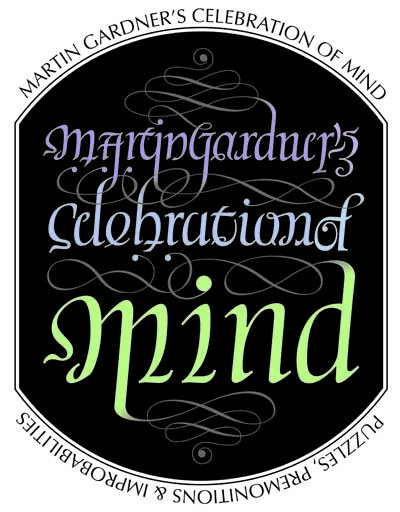 The two images are 180 degree rotations of each other, and the words on each make sense in a Gardner context, one orientaion reflecting some of his numerous interests. 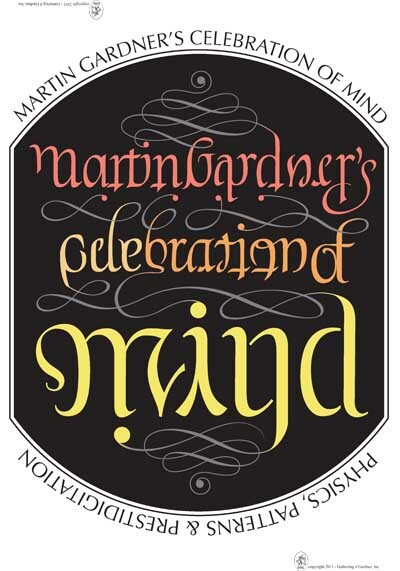 It reads the same as the 2010 image one way ("Martin Gardner's Celebration of Mind"), yet makes sense in a different way when rotated. 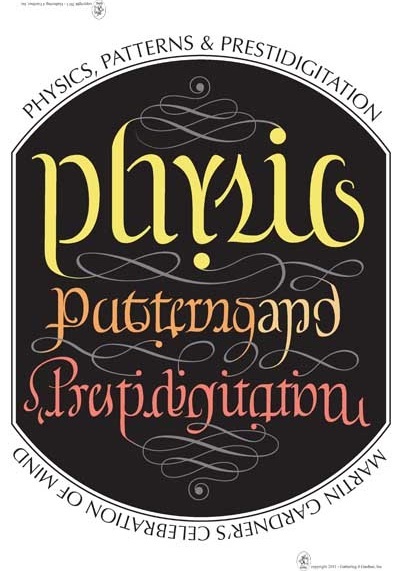 All told, this means that the following images say the same thing, although they are written in different styles, yet express totally different on theme concepts when the images are rotated (or inverted). With two of these held back to back, in their card incarnations, one can thus perform a minor miracle by showing that "it" says the same thing one way, but two different things when inverted. 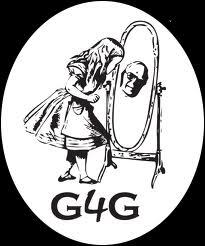 The above logo for G4G8 was also designed by Scott Kim. 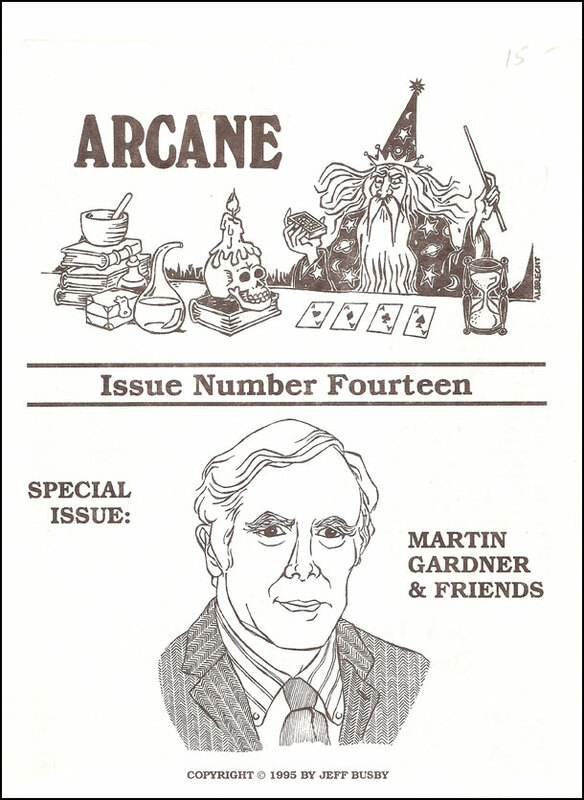 This was designed for the cover of Arcane (No 14, 21 Oct 1995), a special issue in honor of Martin's 71st birthday. 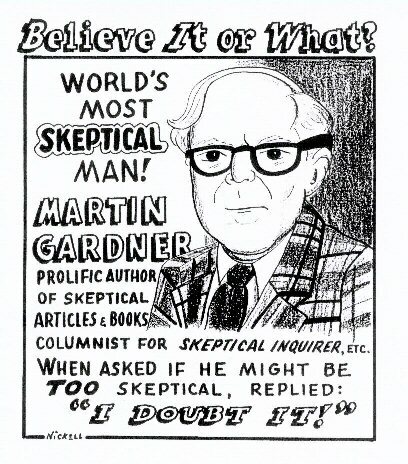 This cartoon was presented at the second Gathering 4 Gardner conference in Atlanta, GA, in 1996. 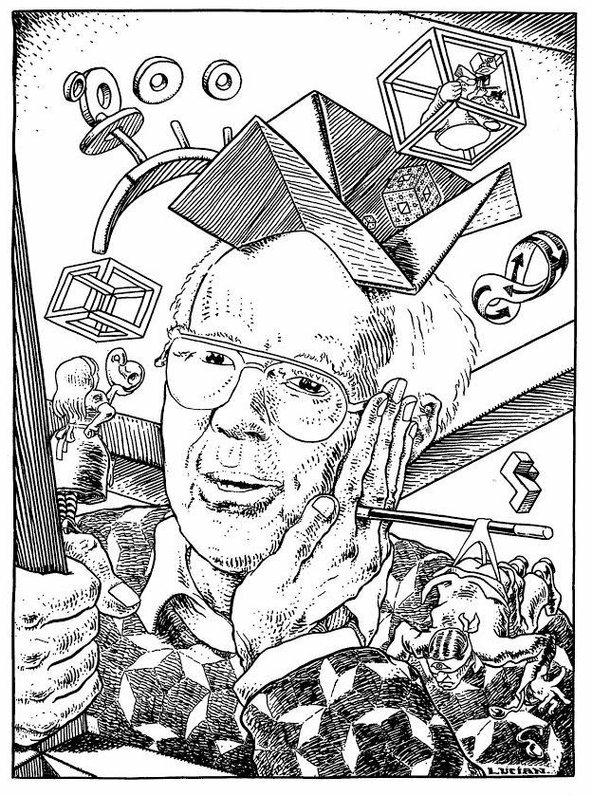 This drawing was done to accompany Geoff's own appreciation "Martin Gardner: Genius Debunker" The Yukon News (Mar 2004). 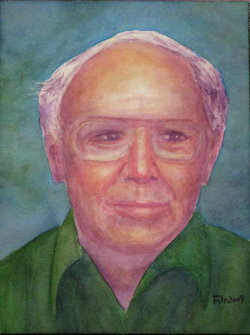 The above Ken Fallin original accompanied the article "Gathering for Gardner" from the Wall Street Journal (2 Apr 2010, Robert P. Crease). 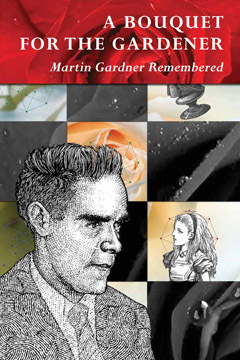 The cover of a A Bouquet for the Gardener (Lewis Carroll Society of North America, 2011), a book honoring Martin, with cover designed by Andrew Ogus featuring a portrait of Martin by Mahendra Singh (2011). 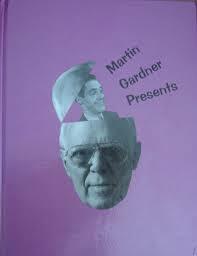 The cover of Martin Gardner Presents (Kaufman and Greenberg, 1993) features a photo collage by Richard Kaufman showing the head of a young Martin emerging from inside the head of a more mature Martin. 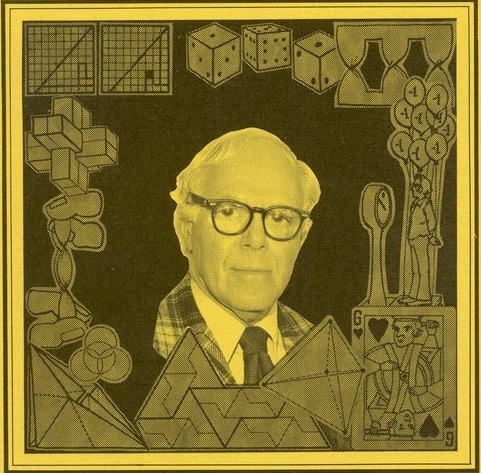 This image was used for the cover of a special issue of a journal honoring Martin (1994). 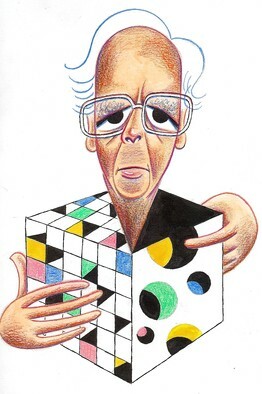 This image was created for the cover of an issue of a Scandinavian mathematical journal. 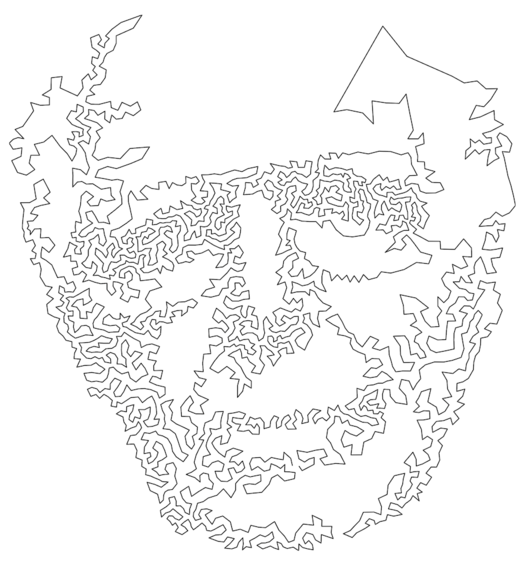 This image was designed for the cover of a special issue of a journal honoring Martin (2010). 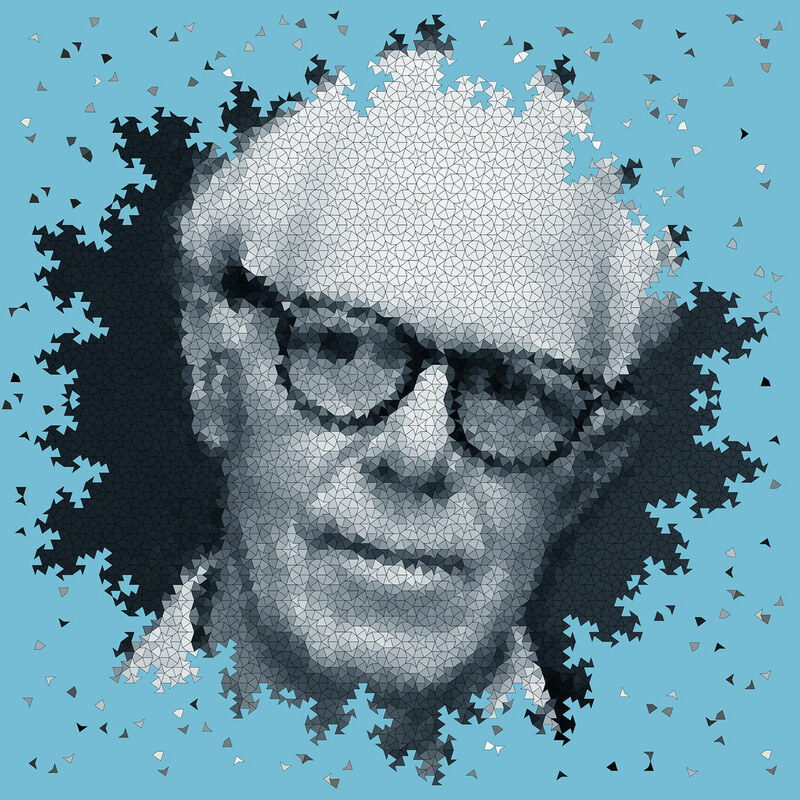 That was used for the cover of special issue of a journal honoring Martin (Jan 2012), where it was titled "Martin Gardner Four-Coloured." 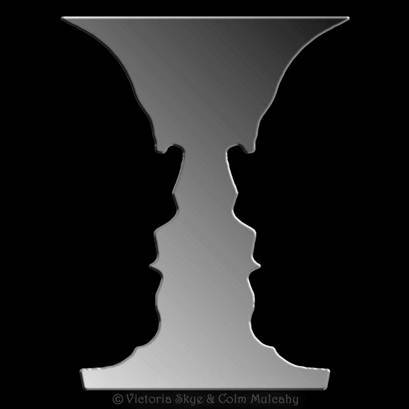 Atlanta magician and illusion artist Victoria Skye came up with the following Rubin's vase illusion in 2012. It's based on a photo of Martin's face in profile, and has been used on the WWMGT Twitter account. 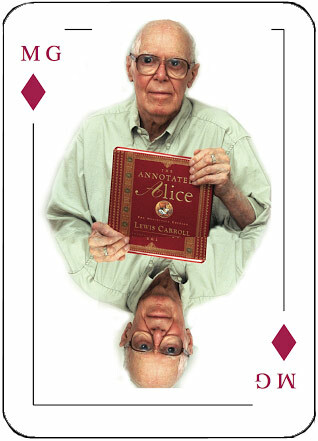 Davidson College mathematician and mime Tim Chartier came up with the following in 2014. 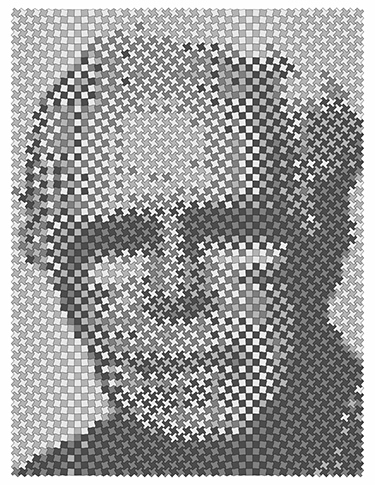 It's based on a Traveling Salesman implementation of a photo of Martin's face, and was featured in Tim's Huffington Post Apr 2014 article Don't Beware of Math... Be Aware of It! 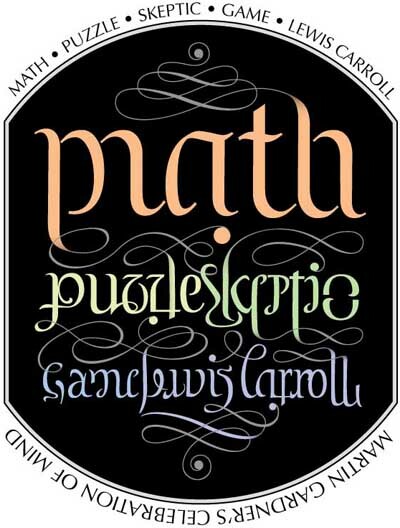 written in connection with Mathematics Awareness Month 2014. 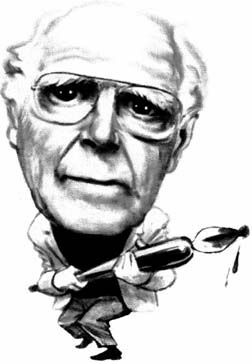 Artist Lucian McLellan came up with the following to mark Martin's centennial. 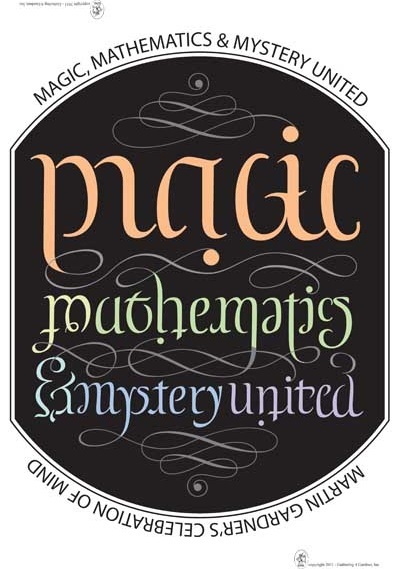 It was featured in Gary Antonick' New York Times "Numberplay" blog Ignited by Martin Gardner, Ian Stewart Continues to Illuminate (27 Oct 2014).